Roy Halladay was traded to the Phillies in 2009 but was drafted by the Blue Jays in 1995. Citing a desire to avoid surgery for an ailing back and wanting to spend more time with his family, the two-time Cy Young Award winner retired Monday after 16 seasons in the major leagues with the Toronto Blue Jays and Philadelphia Phillies. Halladay signed a one-day contract to retire as a member of the Blue Jays, where he spent the first 12 years of his career. The 36-year-old right-hander choked up and held back tears while making the announcement at a news conference at the winter meetings in Lake Buena Vista, Fla.
Halladay pitched a perfect game and also a postseason no-hitter. But never made it to the World Series and leaves without the ring he badly wanted. The Phillies had already won three straight division championships, the 2008 World Series and 2009 NL championship by the time Halladay arrived in a blockbuster trade the same day Philadelphia sent ace Cliff Lee to Seattle in a separate deal. The Phillies had the best record in the majors in Halladay’s first two seasons, but lost to San Francisco in the 2010 NLCS and St. Louis Cardinals in the 2011 NL division series. In his final postseason performance, Halladay lost to Chris Carpenter and the Cardinals 1-0 in the decisive Game 5 of that 2011 matchup. Down 2-1 in the series, the Cardinals won two straight to upset the Phillies after a squirrel scampered across home plate as Skip Schumaker batted against Roy Oswalt. 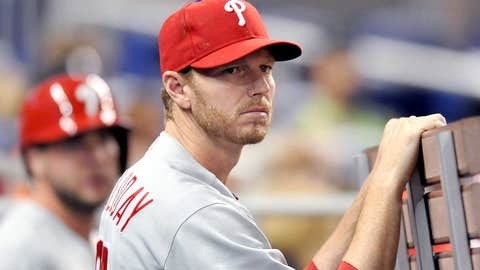 Known as a workhorse, Halladay led the league in innings four times and in complete games seven times. ”He was one of the best competitors who ever played this game and taught everyone around him to prepare the right way in order to be the best,” Phillies lefty Cole Hamels said. Despite Halladay’s decline, the Phillies were still interested in bringing him back for another year if he was healthy and at a price much lower than the $20 million he earned in each of the last three seasons. He was a popular teammate and a valued presence in the clubhouse for his influence and strong work ethic.